BestCare EMS offers training sessions to field personnel who are taught per the standards of the Texas Department of Health and American Heart Association. All Paramdics are required to maintain ACLS, PALS, PEPP, and CPR certifications which require continuing education classes. For more information about EMT Training, Licensure & Certification in Texas, Visit the Texas Department of Health Services. 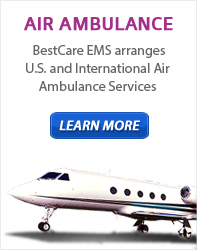 Call our offices at (800) 686-3588 for more information or Request an Online Quote to schedule your Medical Transport.